I am writing my story about Corned Beef and Cabbage today, because on St. Patrick’s Day I was cooking, photographing and eating my Corned Beef. And no, I didn’t cook my Corned Beef before St. Patrick’s Day or last year so I could just re-post. 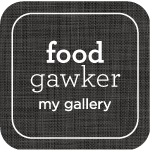 Actually, I made my Corned Beef in anticipation of the leftovers, you know, corned beef hash and Reubens, which are delicious and photogenic. And in my near future. 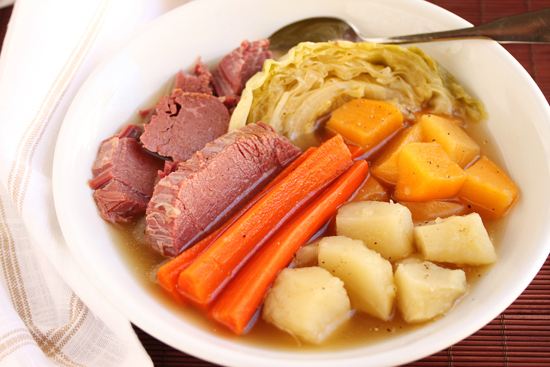 I must say that the Corned Beef and boiled vegetables in the photo above is a study in simplicity, but what you can’t see is how the broth tastes. You see, that broth is an elixir, a veritable spice, meat and vege liqueur that has permeated all the ingredients with its amazing flavor. The broth is redolent of the salt, brown sugar and spices of the corning brine, which includes the notes of cinnamon stick, mustard seeds, cloves, all spice berries, juniper berries and ginger. 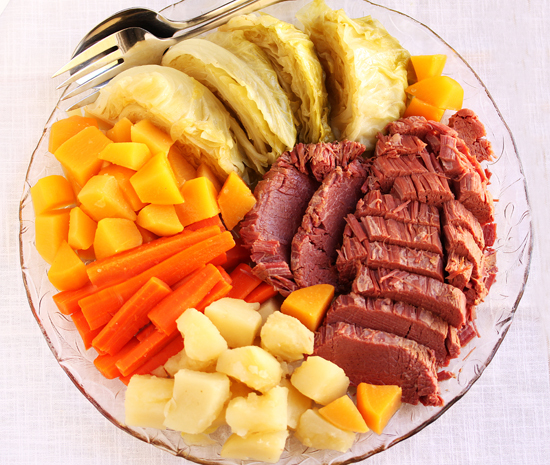 The traditional root vegetables to cook with Corned Beef are potatoes, carrot and parsnips. But you know me, I have to tinker, so I used rutabagas in place of parsnips. I am Norwegian, after all. And they add so wonderfully to the taste of the broth, plus I love their color and texture. So why do we celebrate St. Patrick’s Day on March 17th? Because that is the date of his death, although the year is a bit murky, but definitely in the second half of the fifth century, maybe 461, 463 or 493. Depends on who you’re reading. St. Patrick’s Day is celebrated in numerous countries and there are millions of Irish or Irish-descended people all over the world. In the year 2000 in the U.S. there were 45 million Irish-Americans, which was 1 in 5 white Americans. St. Patrick would be so proud. 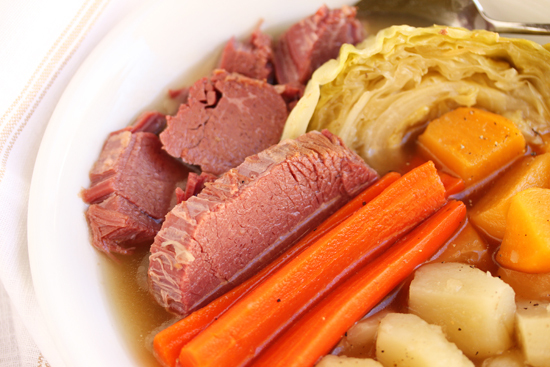 And why do we eat Corned Beef on St. Patrick’s Day? Well, back in the day, Ireland was an English colony. Ireland’s land was used to pasture vast herds of cattle, whose meat was made into corned beef and shipped back to Britain. The cattle belonged to the English and were a source of great wealth. In the 1600’s, Dublin, Belfast and Cork created vast beef curing and packing industries to feed the British Isles. By 1845, raising cattle for production of corned beef crowded out land necessary to feed the local population. They were forced to farm smaller, more marginal plots of land, planting potatoes that could produce a large crop in less favorable soil. The Irish did not eat the corned beef products because the cost was exorbitant, because the cattle were owned by the British, and virtually all the corned beef was exported. Then the potatoes turned black with blight and the Irish starved. Between 1845 and 1852, about a million people died and another million emigrated. By 1850, the Irish made up a quarter of the population of Boston, New York City and Baltimore. I do not mean to trivialize the tragedy of Irish history, I’m trying to explain why we eat corned beef on St. Patrick’s Day. You see, corned beef was a luxury product back home to the Irish immigrants, while it was cheaply and readily available in America. 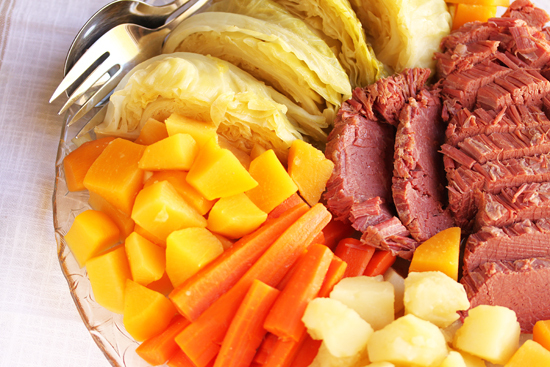 Corned beef is not considered an Irish national dish and the connection to St. Patrick’s Day specifically originates as part of Irish-American Culture. And that is why we eat Corned Beef on St. Patrick’s Day. 2. Place corned beef, brine and spices in a large Dutch oven or deep pot and cover with water by 4 inches. Bring to a boil, skimming froth and coagulated protein from surface of broth. 3. Cut the onion in half lengthwise, peel and stick cloves into each half. 4. When the water comes to a boil, continue skimming to remove as much debris as possible. Add the onion, bay leaves and chile de arbol to the pot. Cover pot tightly with aluminum foil and tight fitting lid. 5. Place covered pot in oven and braise for about 3 hours, or until a fork easily pierces meat. Carefully remove foil to avoid steam escaping. 6. A half hour before the meat is done, peel the carrots and cut in half lengthwise. Peel the rutabagas and cut into 1-inch chunks. Peel potato and cut into 1 inch chunks. 7. Remove tough outer leaves of cabbage and cut head in half, top to bottom, through the core. Cut each half into 3 wedges, through the core. 8. With large tongs, remove brisket to a platter, covered with foil to keep warm. 9. Bring broth to a boil and then place cabbage, carrots, rutabaga and potatoes in pot. Add enough water to cover by an inch. Place cover on pot and leave about a ½-inch opening for escaping steam. Bring to a boil and then turn down to a simmer. Cook vegetables for about 15 minutes or until very tender. Test and remove to platter if one is done before the others. 10. Remove vegetables to warmed platter. Place brisket back in broth to reheat, then remove to cutting board to slice into ¼ to ½-inch slices. Place slices on platter with vegetables. 11. Pour broth through your finest sieve into sauce pan to remove all particles. I used my chinois. Pour a nice amount of broth over beef and vegetables before serving. Serve in flat soup bowls, passing extra broth at table. Thanks for the history, that was fascinating. Your corned beef looks so lean and perfect! 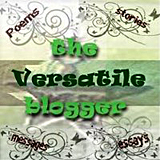 A good read! I love the mix of ingredients too…This is a hearty dish! This is one of my absolute favorite meals I love St. Patrick’s Day time because we get it twice in that week! The 17th century English and Irish industrial processes for corned beef did not distinguish between different cuts of beef beyond the tough and undesirable parts such as the beef necks and shanks.